Toastmasters Speeches: Connect With Your Audience-Sample Speech IP2, "Progressive Pull-Ups"
Connect With Your Audience-Sample Speech IP2, "Progressive Pull-Ups"
This is my 6th speech under Pathways. The speech was delivered at the BF Community Toastmasters Club (BFComm) in the Apr.7, 2018 Toastmasters Meeting. Krissie Rebolledo TM, evaluated me for this speech. Now, some of you may be wondering what that was all about. What I just performed... as an imaginary pull-up… and a rather unsuccessful one! What’s a pull-up anyway? Well, our friendly internet tool named, Wikipedia, tells us. It is an upper-body exercise and the name refers to pulling up one’s own body weight while gripping on a pull-up bar. It can be performed with any grip. Imagine this pvc as a fixed iron pipe as my pull up bar. With the palms outward like this in an overhand grip, it’s called a pull-up. But with the palms facing away from me like this or underhand grip, it is called a chin-up. Good afternoon, everyone. The last time that I was able to do five consecutive pull-ups was when I was a college freshman... not so long ago. I was much thinner and lighter. Now, about 70 pounds later, I could only dream of being able to do them again. And I mean literally dream that I could move swiftly across monkey bars. Not dreaming like I was a monkey, but that I was like Spiderman! So now, it’s an item that I’ve put in my bucket list – and that’s to be able to perform not 5, but 10 consecutive pull-ups. Now, you may ask. How difficult can they be? Some very fit people, and I see a few in this group – some are even into martial arts, it may not be very difficult. However, for many ordinary folks, including me, cannot even do one good successful pull-up. There are 3 ways or a combination of 3 ways on how you can condition the body to allow you to perform pull-ups. The first is to develop upper body strength using targeted weight training. This is obvious, because pull-ups require adequate shoulders back and arm muscles to be performed. 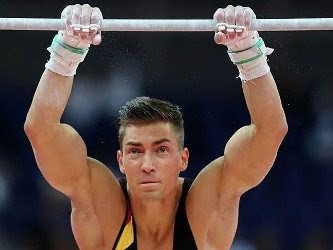 Think of gymnasts who have exceptional upper body strength. Strength Training. The second is to lose weight. And this may be a no-brainer. The less body weight you need pull, the easier will be for you. Think of rock-climbers. You don’t see many rock-climbers who are massively built, do you? They’re usually quite lean and capitalize on their light body weight to pull themselves up. So, number 2, lose weight. The third is to perform progressive pull-ups. These are exercises which when performed will allow you to feel the pull-up movement but with less difficulty. One of my favorite techniques are band-assisted pull-ups. 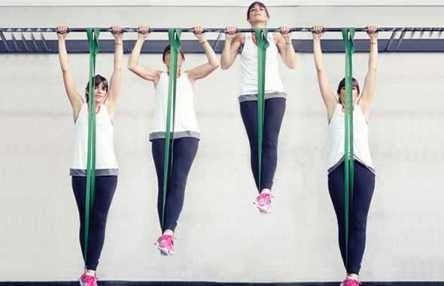 The idea is to use something like a huge rubber band to help you support your body as you hang on a pull-up bar. You then use the elasticity of the band to assist you to pull your body up. So, again, imagine this pvc pipe to be an actual iron pipe pull-up bar. I hang on to the pull-up bar like this. I then put my foot inside the band, like this. Then I put my entire body weight into the band, letting myself down. What then happens, is that the elasticity of the band pulls me back up! By doing this with more and more repetitions, I will be able to perform the movement progressively until I’m able to get rid of the assistance band altogether. Thank you, volunteers. Let's give them a round of applause. Apart from developing upper body fitness, pull-ups help develop the abs and improve the posture as it relaxes and strengthens the spine. And there are many other reasons why I’ve put performing pull-ups as an item in my bucket list. What about you, have you thought of an exercise or movement that you wanted to be able to do so much that you put it down in your bucket list?